A couple nights ago I spent the better part of an hour talking with a family friend who is a lawyer that works in the trenches of intellectual property and copyright. He was interested in the Research Works Act and was trying to find out exactly why this one sentence act is so troubling to scholars and librarians. I probably got more out the exchange than he did because there's nothing like being grilled by a lawyer to force you to articulate how and where you stand on a issue. In the end, we were able to pinpoint what is egregious in this act: it gives all rights to "network dissemination" to the publisher instead of the copyright holder. But before we reached that point, I had to answer a lot of difficult questions about scholarly publishing, and I found that, to my lawyer friend, all the stories that I was telling about The Big Deal, the intractable pricing levels based on the historic spend and the entrenchment of citation impact factors as a measure of merit in the advancement and tenure processes ... well, they were all very interesting but off-topic. Again and again, he pressed me with this: "If scholars continue to submit their work to journals provided by commercial publishers, then clearly the publisher provides additional value, no?" Yes, I concede that there are commercial publishers, like Nature, who have, over the years, invested in their publication to justify their standing as an important journal. But most commercial publishers have not made this type of investment. You see, journals historically were produced by scholarly societies for themselves with prices largely set as cost-recovery. But after World War II, it was recognised that scholarly communication was a viable commercial product and commercial publishers made attractive offers to scholarly societies to sell their journals so they wouldn't have to worry about the costs of the distribution, editorial communication and co-ordination any more. But now with the Internet, the costs of distribution and co-ordination have come down to almost zero, which is why this act is in place: to prevent scholars from building new systems of "network dissemination." And so here we are. I've signed the petition not to publish in, not to referee, or not to do editorial work for Elsevier. Now what? Well, I think we are not as far from a post-Elsevier world than some may think. We are already developing new forms of practice to recognize "non-traditional" evaluation of scholarly work. It was at last year's Great Lakes THATCamp when I heard about a great way to evaluate the scholarly merit of a scholar's blog: you ask other scholar bloggers to evaluate the work. It's called peer review! How novel! By the way, the opportunity to share and learn from these kind of stories and strategies is just one of many good reasons to join us at this year's Great Lakes THATCamp. And while I'm shilling unconferences, I'd like to mention that I will be helping host the next code4lib North that is tentatively scheduled for May 24/25. 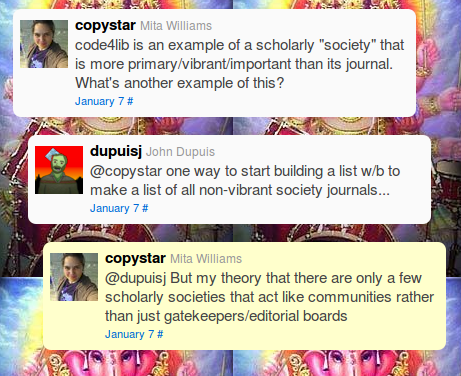 working on an post idea: "one journal = one community" not "one journal = editorial board"